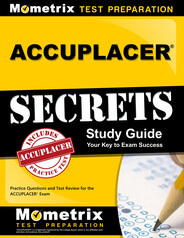 The Advanced Algebra section is the most challenging of the three math sections on the Next-Generation ACCUPLACER. It covers primarily college level math that you may not have encountered yet. However, it’s still important to do your best so they can place you in the correct level introductory math class. How Long Does It Take to Complete the Advanced Algebra Section? On test day, you should show up to the testing center at least 15 minutes early with a valid, government-issued ID. The test itself is untimed and you are allowed to take breaks as needed as long as you let the proctor know. That means you can and should take your time. Get up and stretch your legs, have a drink of water, go to the bathroom. Do what you need to do to be as relaxed and comfortable during this exam as possible. If you’re feeling burned out part way through, you’re even allowed to pause the test and finish it another day. Again, just let the proctor know and schedule your appointment for completing it. With that said, if you are trying to get a rough estimate of how long you’ll spend at the testing center, you can probably expect to spend between four to six hours on the test itself plus 15 minutes for checking in beforehand and however much time you need for breaks. The advanced algebra section itself will probably take about 60 to 90 minutes. But remember, all of these are just rough estimates. The actual time you need may be much lower or much higher and there’s nothing wrong with that. Which Types of Math Questions Will Be Included on the Math Advanced Algebra Section? This section contains the highest level math problems that you will see on the test. If you only took the minimum required math classes during high school, there will probably be some stuff on this section that you haven’t even encountered before. While there will be a calculator allowed for at least some of these questions, they do not provide information in advance about which ones specifically. That means you need to prepare for this test as if you won’t have a calculator at all so that you will be ready to tackle any problem, whether or not one is provided. It might seem daunting to study for this section of the test since it is so difficult but as long as you have the foundations of introductory algebra and geometry, you should be able to gain enough of a basic understanding of this higher level of math to do well on the test. Moreover, this is a placement test, not an admissions test so if you don’t do that well on this section, it will simply mean you are likely to get placed in a math class that will teach these subjects. If that thought doesn’t appeal to you, study enough now that you have a good chance of testing out of that math requirement! What Is the Highest Score on this Section? The highest score on the advanced algebra section is 120. The closer to this you get, the better your chances are of testing out of an introductory math class requirement. Some universities and colleges will have a minimum cut off so make sure you find out what, if any, cutoff you need to aim for so that you can prepare accordingly. How Should I Study for the Math Advanced Algebra Section? Depending on which level of math you went up to in high school, the material in this section might be somewhat familiar to or it might be all entirely new. It covers more advanced concepts in higher level algebra and geometry as well as trigonometry. These are subjects that aren’t usually required in high school so it’s definitely important to study for this section of the test. If it is unfamiliar material for you, the best way to prepare is through a combination of reviewing detailed explanations of the concepts and processes and then applying them to actual problems that are similar to what you’ll see on the test. With the Mometrix Study Guide, you’ll be able to do both. This guide has been designed by experts who have advanced knowledge of these higher level math subjects. They provide easy to follow explanations and instructions as well as extremely useful tricks for figuring out how to approach any math problem. Along with the comprehensive review of the math, you’ll get plenty of practice questions where you can apply what you’ve learned on problems that are designed to be similar to what you’re actually going to be expected to solve on the test. 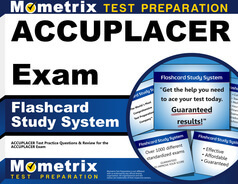 For even more help with mastering this very challenging section of the test, order a set of Mometrix Flashcards. Not only will they come with even more practice questions to help you prepare, they’re also great for studying on the go so that you can take every opportunity you have to study. Make sure to use the included guide describing their proven method for studying with flashcards. The method uses a simple game that you can play using the cards and that game will help you absorb the information even more effectively.